A brief note to reassure you that Factary will continue to provide services – consulting, prospect research and training – across Europe despite this morning’s referendum vote. We will be following the negotiations closely and will continue to act, as always, in the best interests of our customers, our colleagues in the non-profit and philanthropy sectors, and of the beneficiaries that you serve. We will monitor any implications that this vote may have for cross-border philanthropy and fundraising, and we are ready to discuss any concerns that you may have in this area. Do feel free to contact us to discuss any questions that you may have, at any time. Another window on high-value philanthropy just opened in Italy thanks to UNHCR and Gruppo Kairos, a private banking and wealth management firm. In March, UNHCR published the results of a survey carried out with the finance firm. I am grateful to Giovanna Li Perni at UNHCR for a copy of the report, and for her presentation of the results at last week’s Festival del Fundraising. During October-November 2015 Kairos asked its HNWI clients to complete a questionnaire; 91 of them, 44% women, 56% men, did so. This is not therefore a balanced representative sample of people of wealth in Italy (so we cannot safely extrapolate the results) but does give us at least some insight into how this group of people reacted. The group included a wide range of wealth levels from €1m to more than €30m, and a spread of age groups with, as you would expect, a bias toward middle age and older (85% were aged 46 or over). Almost all of the group were donors – 91% had made at least one donation to a social cause in the previous year (against 26% of the general population). The percentage who gave rose with increasing wealth, reaching 100% of people with wealth over €30m. When asked about their largest gift during 2015 to any one organisation, most reported €5,000, with 73% of women giving at this level and 49% of men. Older people tended to give more, so 22% of the over-65s gave €25,000 and 11% gave €50,000. Of course these people were giving to a number of organisations, so 30% of this older group gave away a total of between €50,000-€100,000 in 2015. Asked about the causes to which they made their largest gift in 2015, 21% chose scientific or medical research, 19% favoured children’s causes, and 16% poverty in Italy. Importantly for UNHCR, 10% chose help and protection for refugees as their top cause. 62% gave principally to causes in Italy. More than half (52%) said that their main reason for giving was because they felt privileged. 26% said it was giving made them feel useful. Interestingly just 4% of donors said that they gave because of their religious values, with 9% saying that they want to change things, to make a difference and the same percentage saying that they gave to continue a family tradition of philanthropy. In choosing a non-profit, two major reasons stood out; the cause, and ‘transparency of the organisation and exhaustive documentation on results.’ This focus on transparency is interesting and is part of a trend we can see across Europe toward greater transparency in the non-profit sector. New laws (for example, in Holland) and new organisations (for example Fundación Lealtad in Spain) are encouraging this trend toward transparency. Italians will tell you that business in the country is based on personal connections, and it seems that this might be true for philanthropy also. It is certainly the case for this group of philanthropists, who say that the most common channel for hearing about the organisations they support is via their personal network (28% of respondents, the largest single group), while 15% say that they chose the cause because they knew the leader of the organisation in person. What does this tell us about strategy? The information in this report is gathered from the clients of one bank, so we should be careful about extrapolating from it. But given that there is almost nothing else available on HNWI philanthropy in the Italian market, we might at least test some conclusions. The research should help push up the pricing of ‘major donor’ programmes. Individuals responding to this survey have made gifts in excess of €100,000 to single organisations, and 20% of them have made gifts of €25,000 or more. We can even venture a Gift Capacity calculation for this group, defining ‘Gift Capacity’ as ‘The largest total gift that one person could give to any one cause, in ideal conditions, over five years’ (see my previous blog on this topic.) Five of the respondents with net worth of €5-€10m made gifts to single organisations of €100,000 or more, between 1% and 2% of their net worth. The research makes the case for prospect research. It shows that personal networks are the means by which these HNWIs have been reached by their non-profit partners, and that these networks are their primary source of information. Prospect research has the tools to identify personal networks. Sadly, the number of prospect researchers in Italy is still in single figures. This research was carried out in partnership with Gruppo Kairos, and we have here a strategic clue that a number of NGOs in Europe are starting to follow up. Private wealth managers and bankers are increasingly interested in philanthropy, and we would all do well to focus more attention on this key group of intermediaries. This is the second year in which UNHCR and Kairos have carried out this study, and the plan is to continue the annual series; another opening window on the world of HNWI philanthropy in Europe. For three years Factary produced a ‘Foundations of Wealth’ report focused on the Ultra High Net Worth Individuals (UHNWIs) and High Net Worth Individuals (HNWIs) (minimum estimated wealth of £10m) that founded grant-making trusts and foundations, featured in Factary’s New Trust Update during 2012, 2013 and 2014. We have now revisited these trusts and foundations to see how they are performing financially and what this means for hopeful beneficiaries. These three reports, all available for free to New Trust Update subscribers via the new online archive service, contain profiles of 104 philanthropists and their grant-making trusts and foundations, of which nearly half are not on Trustfunding.org. Top of the list in terms of estimated wealth is Mrs Usha Mittal (£9.2bn) with other billionaires including the Swire family, the Fleming family, Ian Livingstone and Spiro Latsis. Together they have a combined estimated wealth of £34.36bn – the question is, how much of their wealth are they giving to charitable causes? The biggest giver in terms of charitable expenditure was Sir Peter Harrison – former Chairman and Chief Executive Officer of computer network company Chernikeeff. The Peter Harrison Heritage Foundation had a total expenditure of £4.5m in 2013/14 which included a grant of £2m to the Clarence House Restoration Project and £1.75m to the Imperial War Museum. The most generous philanthropist, giving away the greatest percentage of his estimated wealth as charitable expenditure, was Sir Mick Davis – former Chief Executive Officer of the mining company Xstrata plc from 2001 until its merger with Glencore in 2013. The Davis Foundation had a total expenditure of £2.2m in 2014/15 which equates to 2.95% of his estimated wealth. Grant recipients were not disclosed. Other significant grants awarded by these new philanthropists in the last couple of years include £6m from The Dorothy & Spiro Latsis Benevolent Trust to Great Ormond Street Children’s Hospital and £1m to Boston Children’s Hospital (both in 2013 and hence excluded from this analysis of activity in the last financial year), £2m to the UBS Optimus Foundation by The Holroyd Foundation, £1m to the Royal Shakespeare Company by Lady Sainsbury’s Backstage Trust and £770,125 to Clinton Health Access Initiative by the Surgo Foundation UK. Notable names that have been less than generous with their charitable giving via their foundations to date include Michael Lemos (son of Greek shipping tycoon Constantinos Lemos) whose CML Family Foundation donated £3,406 which is 0.001% of his estimated wealth of £605m and Richard Higham (Group Chief Executive of Acteon Group Ltd) whose Higham Family Trust had an expenditure of just over £6,000 in 2014/15, which represents 0.004% of his estimated £150m wealth. Some of those whose trusts and foundations have shown no financial activity include former CEO of wealth management company Towry Andrew Fisher, Conservative Party donor and Domino’s Pizza franchise owner Moonpal Singh Grewal and Abhisheck Lodha, Managing Director of global real estate developer Lodha Group. Of course there will be a number of possible reasons why these figures are so low – not all their charitable giving is directed through their foundation; this is not their primary foundation; the nature of their wealth means they do not have high levels of liquid assets; or they are still in the process of building up reserves. It is this last point that is perhaps of most interest when we look at the figures. Whilst the total expenditure was only £26.17m in the last financial year, the total assets of the 79 trusts and foundations for which data was available was over five times this amount at £148.7m. 25 of these have assets in excess of £1m and 10 have assets in excess of £5m. This equates to an average of 0.62% of the philanthropists’ estimated wealth, with 15 building up assets of over 5% of their estimated wealth. The foundation showing the largest asset amount is The Christie Foundation founded by Iain Abrahams, the former Executive Vice Chairman of Barclays Capital. The foundation has assets of over £21m for 2014/15 which represents over 40% of his estimated wealth, making him the also most generous benefactor. So far the only identified donation made by his foundation is of £150,000 to the Elton John Aids Foundation, of which he is also a Trustee. What this shows is the considerable potential these trusts and foundations have for the sector. Whilst they may not yet be giving at a level in keeping with their vast wealth, these UHNWIs and HNWIs are ear-marking significant amounts of their wealth to be given away to charitable causes over the course of their lifetime and beyond, sustaining the charitable sector for years to come. The financial data for these 104 trusts and foundations, along with the three Foundations of Wealth reports and all the past issues of New Trust Update dating back to 2005, is available online to NTU subscribers. If you want further information about New Trust Update and our searchable archive please contact Nicola Williams. It’s frustrating because we have so little data on philanthropy. 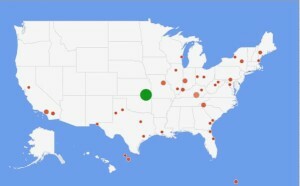 Everywhere I look there is data on philanthropy in the USA, and a stream of clever academic research papers from across the Atlantic on who is giving, why they are giving and what they are giving. But Europe? Yes, there are some very good centres of research, but there are not nearly enough of them. This morning I checked the listings for academic centres of research into philanthropy, at the International Society for Third Sector Research. The results? Of the 153 academic centres of research identified by ISTR, 53 are in just one country. Yes,the USA. The next nearest country by volume of research centres is the UK, with just 11. 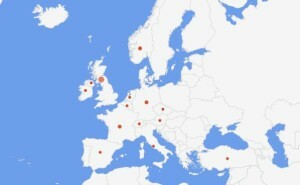 Counting all of the centres across Europe, we still come to a smaller total than the USA with 36 centres against their 53. Quantity is not the same as quality, and Europe’s research centres produce a lot of very useful and valuable data. 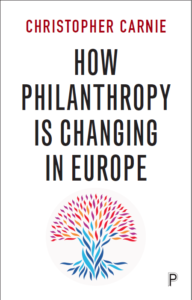 But we are being held back in our understanding of philanthropy in Europe because we have not built the academic power-houses that our colleagues in the US have created. This is a source of bias in our research – with all that wealth of data from the USA the models from across the Atlantic have become the norm. In Europe this has led a few people – notably in France – to look for new paradigms, different models, in philanthropy research. Good news, if we are to build a balanced, culturally-sensitive, understanding of philanthropy.